On September 21st, 2017, The Burrito Project was featured on KCBS2 and KCAL9 with reporter Jo Kwon and the following day we had a radio interview on CBS Radio/KNX 1070 with Margaret Carrero. In case you missed the news segment on Television, the video can be found below. Jo Kwon is super professional. We had a phone conversation on a Wednesday afternoon and made arrangements to meet the following morning while I was cooking for that day’s burrito project. It was a gloomy day for LA with some slight drizzles throughout the morning, but she arrived in style at 9am and the puddles and rain didn’t faze her one bit. She’s a one person operation and very impressive. We both set up in the kitchen, her with the camera equipment and me bringing in supplies for the mornings cooking and burrito making. A big thank you to Brandee “The Bean Queen” AKA Trixee who cooked spanish rice and prepared sauteed onions and peppers for our burritos, as well as supplied us with lettuce and tomatoes from her friends garden. Jo Kwon wasn’t afraid to get dirty even while wearing her pristine business outfit. (As I write this now, I should have supplied her with an apron. Note to self, keep aprons on hand). She helped me with sorting and rinsing beans as well as dicing up tomatoes and cutting lettuce. While the beans were finally sorted, rinsed and set on the stove to cook, the real interview commenced. We talked about so much concerning the burrito project. Why I do what I do. Who inspired me. How I first go involved. Where I get my funding. What my ultimate dreams were for The Burrito Project. Before I knew it, 4 hours had flown by and it was time to wrap up. We took a field trip in Lincoln Heights to distribute the burritos we made for the news segment. We drove around the neighborhood and shared our burritos with the local community. On the segment you’ll see an older gentleman named, John. We chatted for a bit and he had me laughing with some of his stories. When I offered him a toiletry kit he said he ONLY wanted the socks. John said the other stuff should go to people who need it more than he does. What generosity. When I spotted Matthew Ramirez resting under a bridge I pulled over so we could offer him some food. I spoke with Matthew for several minutes then asked if he would be willing to chat on camera with Jo Kwon. He immediately agreed. He is a bright individual and well spoken. We continued speaking for several more minutes after turning of the camera. I hope to meet him again. Here’s an interesting side note and I write this with the hope that he reads this. Matthew Ramirez, in case you get a chance to read this, please contact me. You have many friends and loved ones who care for you and want to help you. I woke up the day after the news segment to emails and phone calls from concerned friends who wanted to reconnect with Matthew. I have made a few extra sweeps through Lincoln Heights and DTLA hoping to catch a glimpse of him. If Matthew can be reconnected to his family and friends I would count that as a win. I trust some magic will happen. It was amazing hearing the outpouring of love from these friends for their friend Matthew. Matthew, I wish you the best of luck and I pray for a reunion. When Jo Kwon and I were done with our interview she stepped into her mobile editing studio (AKA her car) and created the video above. I’m amazed with this woman’s mad skills!!! Jo Kwon connected me to her friend Margaret Carrero, a reporter with from CBS Radio/KNX 1070. We had a lovely conversation which aired the following day. 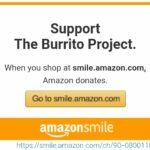 If you would like to get more involved, please join us for our next burrito project!